I put a post in the quiver thread. They’re all on the bumtree and fleabay. You’ll find them. Mate I reckon you’d be mad not to look at the seaxe range. The 7’2 is so versatile. Seriously, if i was going to PNG tomorrow for a trip and could only take one board that would be it. The plan is to give it a few more weeks, then if she hasn't agreed bury her in the sand dunes. I need a new board, too. Didn't you just get a CB egg batoes? Still waiting on it. I won't have it until May the way they glass up there. That's all good - got nerve damage in my left arm and can't even shake my old fella let alone surf. May?! Hope the arm comes good by then mate. Injuries can go and get fkukked! I'm guessing around May? I might call up and see where we are at. Have a look at the Firewire greedy beavers beery. They do look fun. Is your FW a timber tek? Composite boards are great. They only do seaxes in timbertek. Had a few waves in 4ft surf this morning with some wind chop on the surface. Love it. No corky chattering like tuflites. btw, picked up a miller waterskate a few weeks ago and its so much better than the mccoy I had (both 6'10) (not to trigger anyone by mentioning a nugget...). Had been looking closely at a sea-axe, but decided I wanted something a bit shorter. I don’t find the lightness a problem, if anything I see it as a positive. I’ve previously owned a 6’8 waterskate which was the longest serving board in my quiver. 2007 to a few months ago. It had quite a few repairs and got Patto to put a single fin box in, so it would’ve been as heavy as a 6’10). I surfed it on and off for years. The difference I find is that for the size, the epoxy is a bit more buoyant so it paddles as well as my 7’10 PCC single. But with less weight in the construction, combined with the more refined and curvier tail, I reckon it turns as well if not better than my 6’8 did, the rails are far less boxy and that helps with my turns aswell. Last paragraph X 1000 re my jd. Can reduce rail volume without it bogging. But when the waves have more push you can get the rail in. If I had the same board scaled down to 6'6" and a touch wider I'd be set for smaller/average days. Gonna order something like this. Love the idea of a Christenson middy but the reality is a more rockered quad will suit a wider range of waves. Very smooth looking board mate. Kinda done with standard short boards for ground swells for 4ft up. Just not enjoying that much anymore. 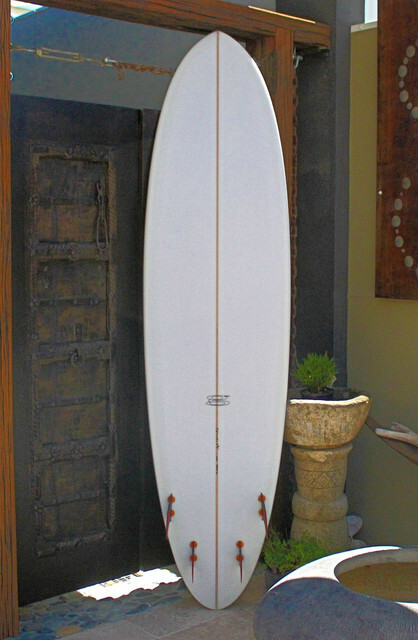 Ordered a Devon Howard 7ft from Donald Takayama. Looks pretty loose and fun for a bigger board. 7ft plus it's 2+1 for me, the only reason I didn't order a C bucket from Christensen is it only comes in a single. C bucket? Don't think it's proven. Been down that track of tweaking proven designs and it hasn't worked, well for me anyway.